Whew, after 30 hours of flights, delays, layovers, and running to terminals, I made it to Kunming, The Spring City. I can’t forget that I made some friends along the way. I had a 4 hour delay in Chicago, which meant I would completely miss my flight in Shanghai. Luckily, there were some determined American Airline workers who helped me out. At first it seemed futile to find a new flight. No one answered the numbers I called and the flights looked full on the China Eastern website, so I just sulked away with my food voucher and ate some chips with guacamole. At the restaurant, I made a friend named Mike who was on route to his sister’s elopement in Hawaii. We made small talk and luckily he heard my name being called over the airport intercom, “Molly O’Connor, please return to terminal 3, Gate K14. You left a belonging at the gate.” I bid him farewell and while I was walking back to the gate with both my bags, I was wondering what I could’ve forgotten. Well, the two female workers who helped me before had huge smiles on their faces. I went up to the counter and they told me that “I had forgotten my ticket at the counter.” I pulled my ticket out of my pocket and then looked at the ticket they gave me. I realized then that everything was identical, except for my new flight number to Kunming. I was so relieved. I gave them both really tight hugs and asked how they did it, but all they said was “we just had to pull a few strings.” On that note, I took my 14 hour flight to Shanghai. I mostly read Game of Thrones during the flight. I also, watched Argo (which was very good by the way, you guys should see it). Lastly, I sat next to a Chinese man who helped me with some vocab and he also let me use his phone to call my sis from Shanghai. He’s a keeper. Landed in Shanghai and got through customs very quickly. Got my flight changed easily enough (thanks to the nice ladies in Chicago and thanks to my sister’s mandarin advice). Met an Australian named Peter. Nice guy, he also let me use his international phone to call my sis at the gate, just to let her know there were no delays. My last friend I made during my flight was named Kenny. He is a chainsaw artist. Right before entering the plane I saw him on the platform. Sadly, he seemed worse for wear because he barely slept on his earlier flight. I let him borrow my neck pillow and he let me know after that he slept like a baby. He also had no RMB on him AND knew no Chinese, so we gave him some cash and Colleen told the taxi where to take him. I’m planning on meeting up with him in Kunming to see his art studio and to get be reimbursed. 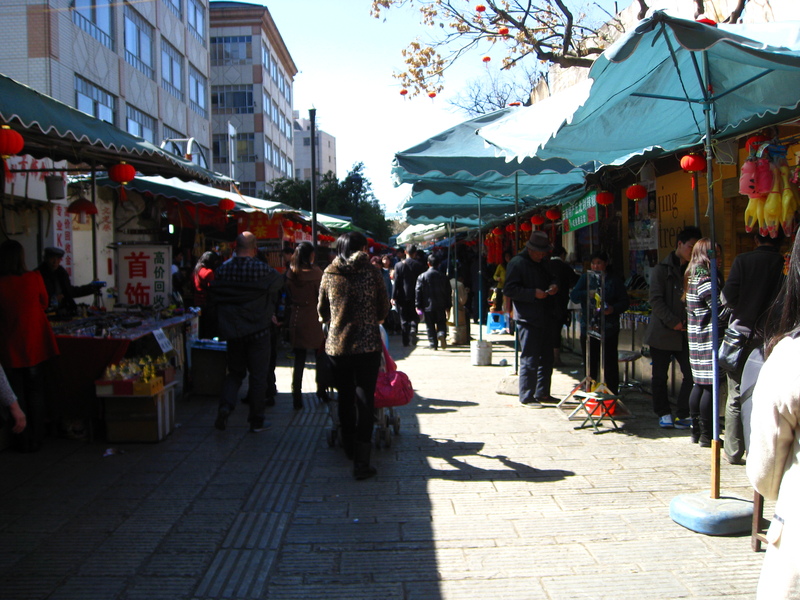 Well, since the flight, I have spent a whole day in Kunming. Colleen gave me a short tour. She brought me to the Bird and Flower District. Lot’s of things to see. Especially all the Spring Festival garb and decoration! 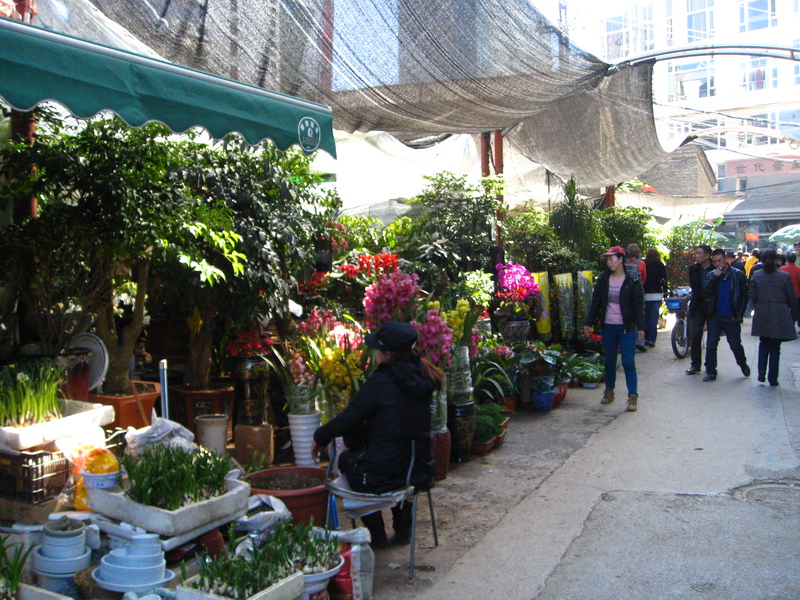 Just a small part of the flower market. It smelled amazing! After walking around the market we played with some puppies that were being sold down the street, we sat and listened to the birds at the bird market (people also brought their own pet birds to socialize), and then we chilled at a cafe. Colleen drew and I read some more of my book. At around 6:30pm, Colleen introduced me to her friend James and they brought me to a Dai minority restaurant. It was very tasty, especially the grilled pork and sour mashed potatoes (oh and the fried bananas, yuuuum). I pretty much passed out on Colleen’s bed after that. ← After months of preparation, I am finally ready. The journey was worth it knowing who awaited you at the end!